Drawing inspiration from Prince Edward of Woodstock, the Black Prince Sword with Sheath is an ornate take on historic weaponry. His shield and the motto of the Order of the Garter, of which he was a part of, decorate the sword. The Black Prince was a Founding Knight of the Order, and the round pommel features its Middle French motto, Honni soit qui mal y pense, surrounding a red flower. Golden tones are present throughout the hilt, and golden colored bands stripe the black grip. Angled towards the stainless steel blade, the crossguard features a colorful shield at its center, and colored panels decorate the triangular points of the arms. Celtic style knotwork is etched onto the ricasso of the blade, next to the hilt. 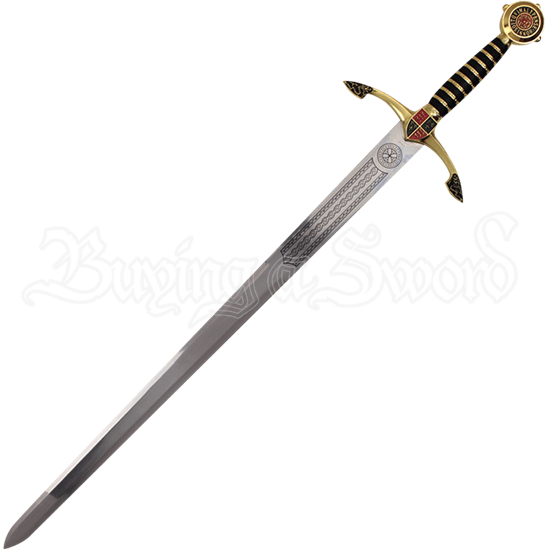 With an included matching sheath for cohesive storage and display, this historic replica weapon makes an incredible addition to weapons collections, medieval themed displays, and even home decor.